A student-painted mural celebrates social innovation in North Brooklyn as part of the Amplifying Creative Communities exhibition. When Baruch Herzfeld’s bike was stolen in 2008, he went online to purchase a new bike and discovered a police auction site where bikes were available at $8 a piece. On the spur of the moment, he purchased 500 and established Traif Bike Gesheft, Yiddish for “non-kosher bike shop”, in his Williamsburg backyard to repair, sell and rent bicycles. Through his business, Herzfeld is not only making cycling more affordable and accessible, but also bridging the gap between the neighborhood’s hipster and Hasidic communities. Herzfeld’s is just one of the stories brought to light in Amplifying Creative Communities: North Brooklyn, an exhibition and workshop series organized by students and faculty in the DESIS Lab at Parsons (Design for Sustainability and Social Innovation), which takes place through November 20 at Arts@Renaissance in Williamsburg. 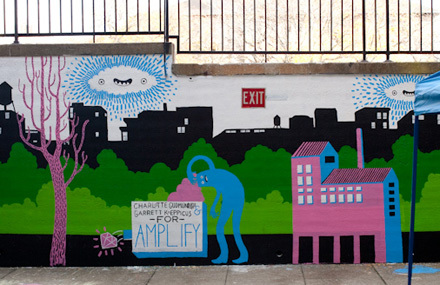 Funded through a grant by the Rockefeller Foundation’s New York City Cultural Innovation Fund, Amplifying Creative Communities is a two-year, design-driven initiative to help neighborhoods and communities strengthen social innovations that create a more sustainable city. These activities range from healthy and local food initiatives, to environmental efforts, alternative modes of transportation, and sharing economies such as co-housing, food cooperatives, and bartering. Last week, MFA Transdisciplinary Design students at Parsons participated in an intensive workshop series led by the DESIS Lab and the design consultancy IDEO to develop ideas for amplifying the social innovations uncovered through the project. The students immersed themselves into the community, engaging with civic leaders and digesting transcripts of interviews that the DESIS Lab conducted over the past year in Williamsburg and Greenpoint. Cansler and his team focused on alternative food economies, from CSAs (community-supported agriculture) to farmer’s markets and composting centers, and how restaurants can be integrated into this process. His team came up with a number of novel ideas, from “CSA Speed Dating,” events where CSA members with different food items would be matched together to create meals, to a North Brooklyn Food Loop, where CSA members would join with local restaurants to have their food prepared by professional chefs for themselves and other restaurant patrons to enjoy. This week, the public can participate in a November 16 workshop with Green Map System, and also a two-day conference with Shareable taking place November 19-20. For more information, visit the Amplifying Creative Communities website. In addition, on November 30, Lara Penin, an assistant professor at Parsons and principal investigator of the Amplifying project, will present the project to the university community as part of the New School Civic Engagement Committee’s Works-in-Progress series. The lecture will take place on November 30 at 12 pm in the Hirshon Suite, 55 West 13th Street, Second Floor. Please RSVP to Amy Minter at mintera@newschool.edu. A series of films were created as part of the project. Watch the rest on the Amplifying Creative Communities website.